In 1872 the growing settlement around Sleepy Eye Lake was officially platted and established as the village of Sleepy Eye. The operation of the railroad and the development of a large milling company followed. With this rapid growth, the need for a Catholic Church was soon evident. That first church, a small wooden structure located where the convent now stands, was built in 1876. 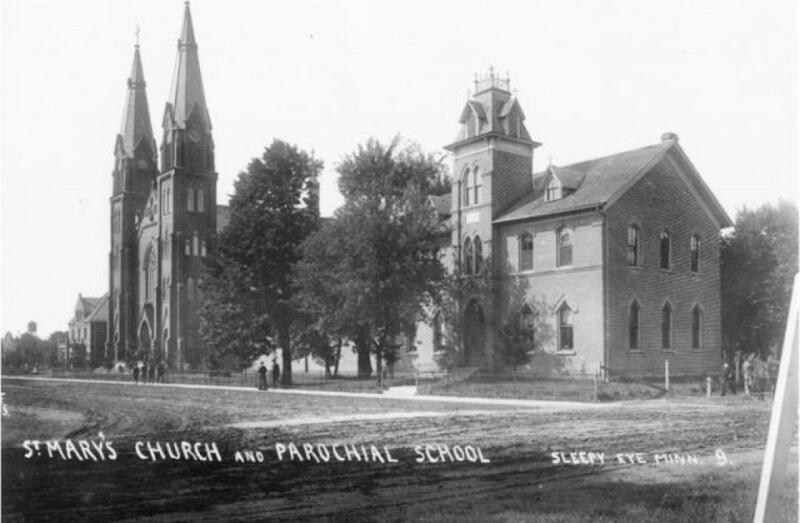 In 1883, the Sisters of St. Francis of Rochester, MN arrived to staff a new parish school. The new school, along with a growing congregation, made it necessary to consider construction of a larger church building. When Fr. Stulz was appointed pastor in 1900, the vision of the new church building began to take shape. Construction began that fall, but in the spring the original contractor asked to be released from his contract. The new builder discovered that the footings were not strong enough for the planned structure and they had to be replaced. 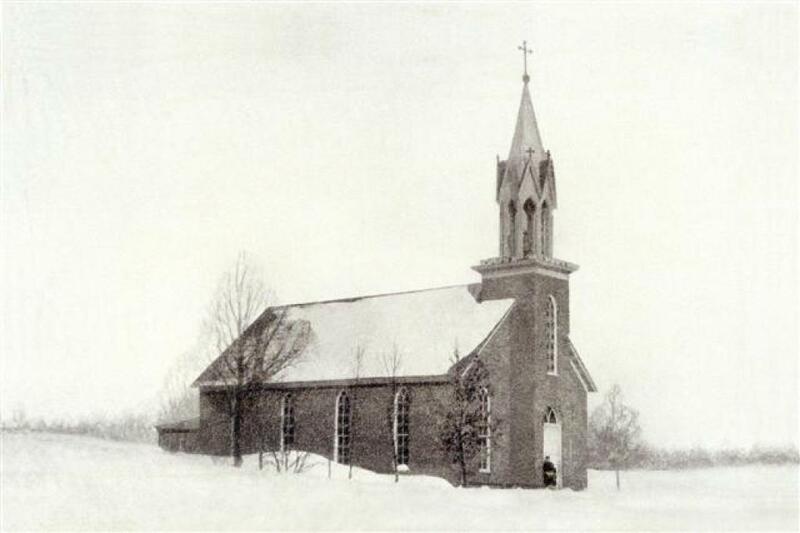 The new Gothic-style church was completed in the summer of 1902. Its two lofty steeples are 170 feet high, while the roof line is 100 feet above ground level. The building is 175 feet long and 75 feet wide. The structure cost approximately $68,000 and seats 1000 people. On October 16, 1902, the church was blessed and dedicated to the worship of God under the patronage of the Blessed Virgin Mary with her title of "Help of Christians." The statuary atop the main altar depicts Pope Pius V and Don Juan of Austria asking Our Lady to intercede on behalf of the Christians in battle with the Turks. Because of the victory a new title was given to Mary: "Our Lady, Help of Christians." The Latin for Help of Christians--Auxilium Christianorum--accompany the statues at the top of the main altar. 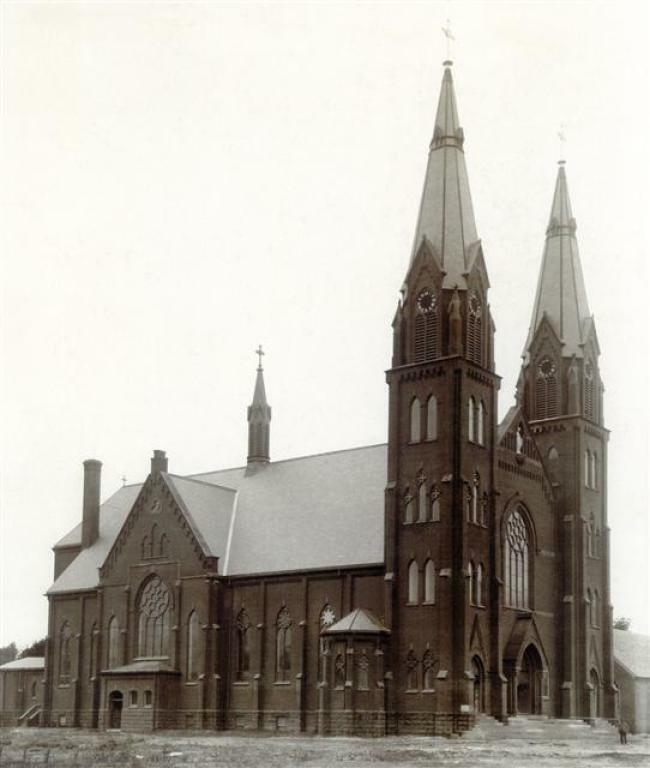 The church building was truly a product of the surrounding area; the red brick was supplied by A.C. Ochs of Springfield, the basement walls are presumably from Mankato or Kasota stone, and the plastering sand was taken from near Sleepy Eye Lake. In 1902 an 8-foot tall outdoor statue of the Blessed Virgin Mary, which weighs nearly 1300 pounds, was placed underneath the stone cross high on the front outside wall of the church. The interior of the church was decorated in 1911 with the theme of a meditation on the life of Mary, Mother of God. The church was redecorated in 1944 and again in 1976--the Parish Centennial year. Symbols of the Catholic faith can be found throughout the church building. The Pentecost theme is represented on the twelve arches which are located within the nave. The Holy Spirit is depicted as a dove on seven of the arches, and these seven doves are each accompanied with one of the seven-fold gifts of the Holy Spirit. On three other arches each of the three theological virtures (Faith, Hope, and Charity) are depicted. The two arches in the choir-loft area have symbols of church music: a lyre and a harp. The dove also dominates the sanctuary ceiling, can be found under the canopy of the pulpit, and also graces the large stained-glass window up in the choir loft. The Stations of the Cross, a familiar Catholic form of prayer and meditation centered around the last day in the life of Christ, surround the nave on the left, rear, and right walls and feature life-sized statues. The ornate gold sanctuary lamp suspended from the ceiling burns continually and symbolizes the constant presence of Jesus in the Blessed Sacrament reserved in the tabernacle located in the main altar. A marble-topped communion rail entwined with gold-like bands of grapes and wheat separates the nave from the sanctuary. Two doors in the communion rail allow entrance to the sanctuary. On one door there is a wooden sculptured image of a pelican piercing her breast to feed her young; a symbol of Christ's sacrifice on the cross and his action in the Eucharist. The other door features a wooden sculptured image of a lamb perched atop a book with seven seals hanging from it; reminiscent of the imagery from the Book of Revelation. Two cathedral-sized stained glass windows dominate the center of the north and south side walls. The window on the south side depicts the Annunciation with the Archangel Gabriel speaking to the Blessed Virgin Mary. The north window depicts the Baptism of Jesus by St. John the Baptist in the Jordan River. 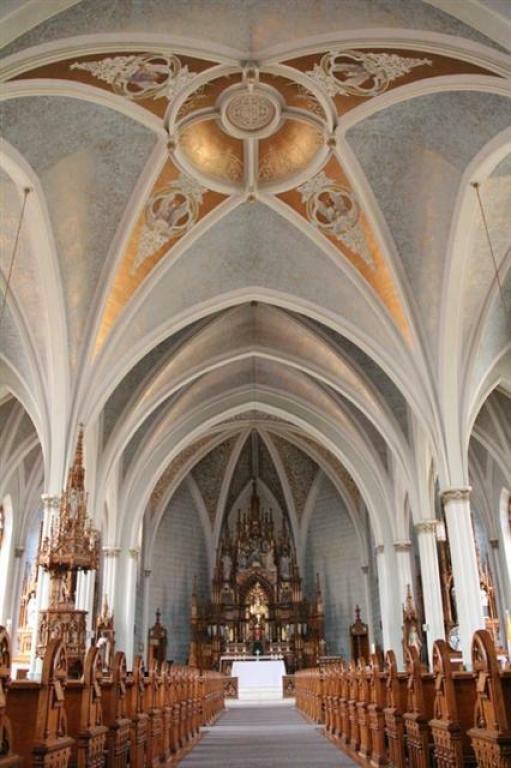 On August 15, 1963--the Feast of the Assumption of Mary, twelve diamond-shaped granite markers were affixed to the inner walls of the church as a part of the building's consecration. Each marker has a bronze cross and holds a candle which is lit on August 15th each year as a memorial of the consecration. The church bells which called the first parishioners to worship continue to do so today. The three large bells which are located in the south bell tower were purchased in 1879 and were original to the first church building. The largest bell weighs 2200 pounds and has an inscription which reads, "I call the living, I mourn the dead, I break forth like the lightning. Parish of St. Mary of the Lake..." The mid-sized bell, named St. George, weighs 1000 pounds and has the inscription, "Praise God with the sound of the trumpet; praise Him with timbrel and choir; praise Him with stringed instruments and organs. Catholic Church of St. Mary of the Lake..." The smallest bell, christened St. Catherine, weighs 600 pounds and bears the inscription, "Praise God with resounding cymbals, praise Him with lute and harp. Catholic Church of St. Mary of the Lake in Sleepy Eye..." These bells, rung by hand for more than 75 years, have been electronically controlled since 1973. In addition to the church building, the parish campus also includes a three-story rectory and a K-12 grade school.